Recipe courtesy of ZESPRI™ Kiwifruit. Arrange kiwifruit around edge of small glass or bowl. 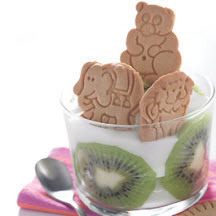 Top with yogurt and animal crackers. Nutritional Information Per Serving (1 recipe): Calories: 180; Total Fat: 2g; Saturated Fat: 0g; Cholesterol: 2mg; Total Carbs: 36g; Fiber: 2g; Protein: 8g; Sodium: 106mg. Recipe and photograph courtesy of ZESPRI™ Kiwifruit.